The Mellow Mushroom on Peachtree Parkway in Peachtree Corners has closed. The approximately 2,500 square foot restaurant, in business for twenty years, abruptly shuttered its doors earlier this week. The Norcross area franchise of the Atlanta-based restaurant had reportedly suffered a sales drop amidst a significant overhaul and renovation at the shopping center. As I detailed in a post this past September, Peachtree Market Place, the center in which Mellow Mushroom was previously a tenant, is expected to welcome new locations of both LA Fitness and Aldi as well as Buffalo Wild Wings. With Mellow Mushroom sandwiched beside the Aldi construction site, it's understandable to see why their business was hurt. In addition to the effects the construction likely had on the pizza restaurant, Mellow Mushroom corporate has reportedly been pushing hard on existing franchisees to complete expensive renovation projects. As a company, Mellow Mushroom is moving away from inline locations in order to prioritize freestanding units. 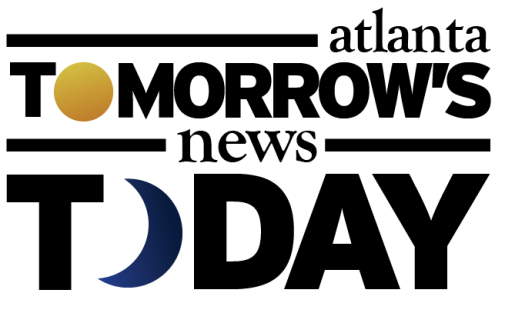 At times, franchisees complete some or all of the requested upgrades, other times they find them to be too costly to complete and either close or rebrand. In Lawrenceville, longtime Mellow Mushroom franchisee Charlie Taylor closed his Mellow Mushroom restaurant this past August. A few days later, Taylor opened "Mystic Moon Gourmet Pizza" in the same space. A source close to the situation credited Homegrown and their renovation demands as being the catalyst for branding change. Another longstanding Mellow Mushroom in Carrollton near the University of West Georgia abruptly closed in 2012, reportedly due to a "franchise disagreement." 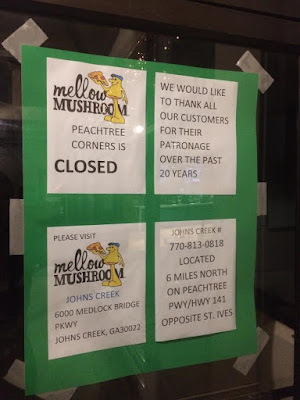 A sign posted on the window of the former Mellow Mushroom in Peachtree Corners thanks guests for their patronage and invites them to dine at the Johns Creek Mellow Mushroom, about six miles north on Peachtree Parkway. Although only four miles from the Johns Creek location, perhaps a new Mellow Mushroom, either freestanding or encap, could come to the upcoming Fuqua Development project, Peachtree Corners Town Center, across from The Forum. While an earlier site plan indicated that Aldi, Buffalo Wild Wings and LA Fitness would open in November, December and "Spring 2017," respectively, at Peachtree Market Place, those all seem to have been delayed. Aldi looks like it could open in late January/early February, Buffalo Wild Wings may open in the spring, with LA Fitness looking more like a summer debut. 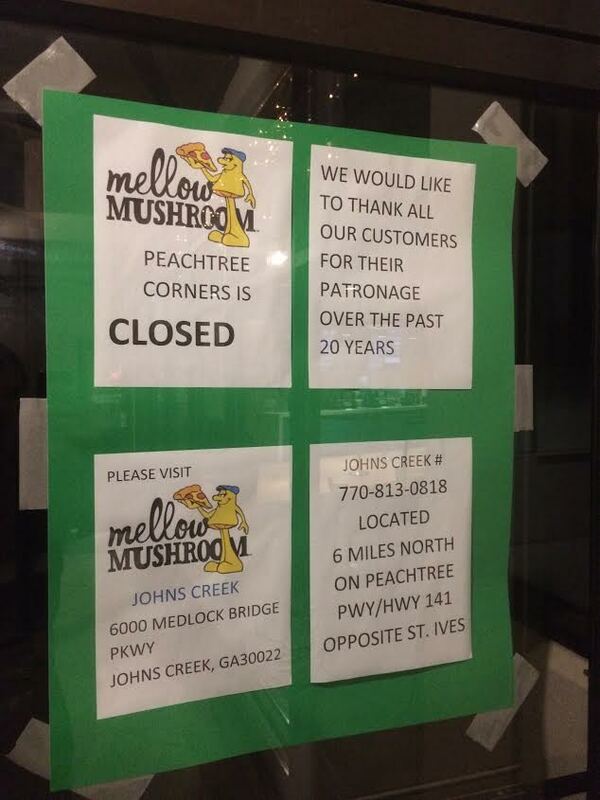 Are you sad to have lost Mellow Mushroom from Peachtree Corners? Do you feel like Mellow Mushroom has become "too corporate?" What else would you like to see open in revamped shopping center? They have always had a terrible location this construction had nothing to do with it. I'm sure the rents have gone up though this will be a thriving shopping center next year not a place to get your driver's license renewed. I saw wings 101 moved down to make room for BDUBS. I was shocked they stayed. I'd had bad experiences the last two times I visited a MM. The last was at the John's Creek location. It was painfully slow. that was a very small location far back in the center. It only offered counter service. There's now a huge new building being built right in front of it. I think the landlord has done a real disservice to the existing tenants. That center has looked like its been in heavy construction for at least a year now with the existing businesses having only temporary signage and the parking lot in worse and worse shape by the month. I wonder how that new theater is doing, it got paid no favors by being one of the first new tenants especially considering it is a very no frills theater. it doesn't even have stadium seating let alone any of the other amenities that surrounding theaters do. It compensates at a lower price point, but the one and only time I went there felt like walking into a theater in about 1988. I was a regular, at the least once a week, at the one that used to be at Powers Ferry & 285. Until last year I'd always choose MM if there was one near. I had a horrible experience at the one in Blowing Rock, NC.  My party of 7 didn't rate an inquiry by the manager and when I got back to Atlanta and stewed a bit more I contacted corporate near Fulton Industrial Blvd. NOTHING! I'm done with MM.